Beasley & Henley Interior Design kicks off the awards season by winning 5 awards for Best Interior Design at the July 26, 2014 Aurora Awards. Their winning projects range from luxury residences to chic small spaces. 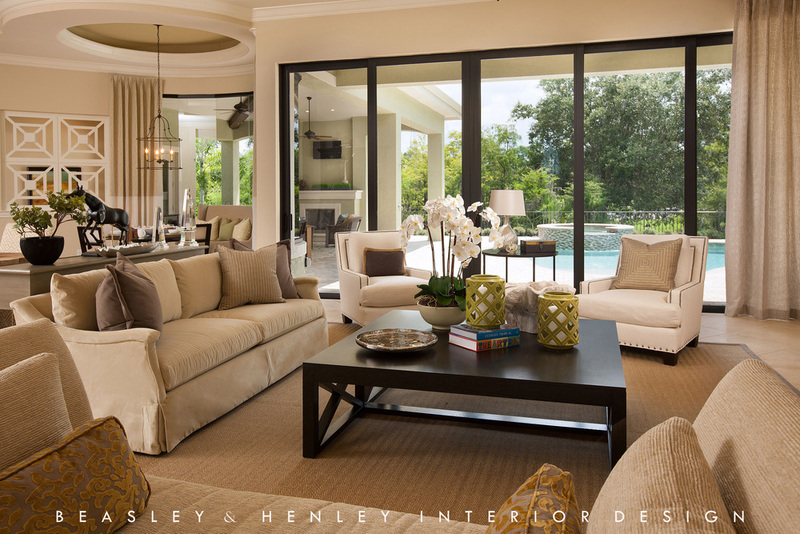 July 2014 –Winter Park and Naples, FL -- Beasley & Henley Interior Design kicks of the 2014 awards season with 5 wins at the 35th annual Aurora Awards. The Aurora Awards are an annual event, held in association with the SouthEast Building Conference, to recognize excellence in design for south east region designers, architects, builders, and others in the design and building industries. The Whitaker- This 2288 sqft town home was designed to appeal to young professional couples and empty nesters. Beasley & Henley won for their use of chic, modern design with classical touches that attract this buyer. The color palette is fresh and vibrant with tan and creams as staples, complimented with pops of the popular colors, “hemlock green’ and ‘dazzling blue’. Located in Winter Springs, Fl it was built by Mattamy Homes. The Palmhurst - Beasley & Henley won Best Interior Design for their high-end finishes and transitional furnishings, with extensive indoor-outdoor spaces, in this luxury single-family home, marketed to empty nesters and vacation buyers. The team kept the design vibrant and youthful by adding touches of energetic burnt orange and deep blue, infusing the home with life, and providing a much needed contrast to the often muted color palette of this market. This 2900 sq ft model home is located in Naples, Fl and built by Stock Development. The Napoli – Beasley & Henley designed this small single-family home for empty nesters and vacation buyers. It won the Aurora Award for Best Interior Design for the team’s creation of comfortable finishes and expert use of coastal casual furnishings with many sophisticated touches. The casual atmosphere is complimented by classical furniture, adding a casual sophistication these home buyers seek. The palette is light with touches of blue, grey and yellow, bringing a relaxed coastal feel. Located in the Lely Resort of Naples, Fl it was built by Stock Development. The Normandy –Beasley & Henley won Best Interior Design of this 4,940sqft home for the atmosphere of relaxed sophistication. Incorporating light colors and high styled furnishings, the design team created sumptuous details, attractive ceiling designs, inviting flooring and luxurious countertops. The furnishings feature a comfortable transitional flair with a color palette of tan, grey, and camel tones along with touches of green and gold. The judges were impressed with Beasley & Henley’s lighting that is notable for its transitional, light style. This chic home, by Stock Development, is located in Quail West, Naples, FL. @1377 Small Model - The 750 sq ft 1-bedroom space appeals to the young renter in the busy Brookhaven area of Atlanta Georgia. Beasley & Henley captured this market, and the award for Best Interior Design, with the retro-pop design using modern design, vibrant colors, and funky artwork. The furniture is modern and scaled to fit into the apartment floor plan. All the pieces were selected to be easily replicated by the renters in their own units. The design is gender neutral to appeal to all renters. Beasley & Henley has won 65 Aurora Awards, 27 Sand Dollar Awards and 24 others including Best in American Living, Pillars of the Industry and more.